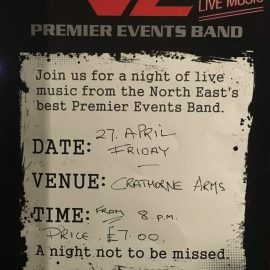 Join us for an evening with V2, the North East’s premier events band. Friday 27th April from 8pm. Tickets are £7 and are available from the bar or by calling 01642 961402. 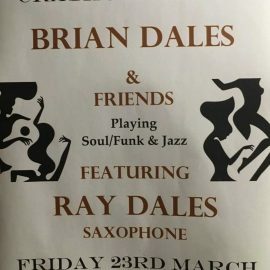 Join us for an evening of Soul/Funk & Jazz in our Music Room with Brian Dales & Friends, featuring Ray Dales on Saxophone. Friday 23rd March. Tickets £7.00 – available to buy from the bar or by calling 01642 961402. Our menu section is now up to date. Chef David Henry is currently working on an exciting new menu for 2018 which will be launching soon. 2018 – New Events Coming Soon! Happy New Year! We will be updating our website with new music events this week. CANCEL YOUR PLANS, COME HAVE SUNDAY LUNCH WITH US! SUNDAY LUNCH MENU IS CONFIRMED AND UP FOR ALL YOU VOYEURS OUT THERE! COME WET YOUR WHISTLE WITH OUR FANTASTIC WINES AND FABULOUS SUNDAY MENU! BRING THE GOOD WEATHER!